talkhealth > Blog > 2016/01 > 1.5 million visitors to What Allergy in 2015! 1.5 million visitors to What Allergy in 2015! Thank you all! What an awesome year! Happy New Year to you all, 2015 was a pretty busy year and this blog just continues to grow. 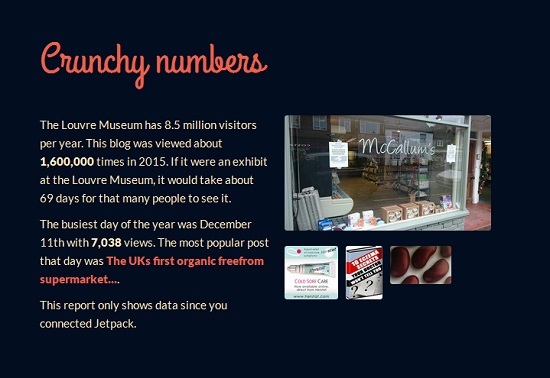 Last year over 1.5 million people visited this blog. That’s awesome! People from 219 counties have visited this blog. That’s eye opening! The busiest day was last month with over 7,000 visitors all excited about a new FreeFrom shop and cafe in Princes Risborough. To read the full report from WordPress read What Allergy’s Annual Report 2015 here. It was an incredible year which saw me being interviewed at home by the BBC about the food allergen regulations, and also live by ITV at The PrintWorks Kitchen in London. I was also invited onto Radio 5 Live and Marlow FM radio as a guest. I spoke at The Allergy Show and The BSACI Conference and once again judged for the FreeFrom Food, SkinCare and Eating out Awards. Let’s see what 2016 has to offer. Bring it on!